20130106 + UP and L in to church to teach Sunday School, the kids were pretty bad for her. 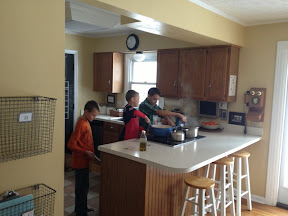 The boys and I got lunch ready and we ate with L got home. We hung around most of the day, G slept a lot which worries us, but he had a long night last night... D&J playing in the backyard with Lilly. In the evening G&I played football on the xbox and then D&J joined us for some Halo. All boys to bed and I got some things ready for tomorrow.